The Western Gray Kangaroo is a very large species of marsupial. Full grown males are about 6 feet tall. They can weight about 120 pounds. The males and females are easy enough to distinguish from each other as they males are generally twice the size of the females. The fur is very thick on this animal and they can range in color from a light shade of brown to a very dark color. They also are shades of gray with white on the front of them. It isn’t uncommon for them to be confused with the Eastern Gray Kangaroo. They have very powerful legs that allow them to hop around at fast speeds as well as to cover very long distances. You will notice the powerful tail as well that they use for balance while standing still and movement. They have a small head and long ears to complete their look. You will find this particular Kangaroo scattered throughout the area of Australia. Some of the main areas where you will find them include Shark Bay, New South Wales, and Queensland. They are highly adaptable animals and as their natural environment continues to be taken away they are moving into new areas. That doesn’t always create an environment where they are able to successfully live in harmony with humans though. One of the unique characteristics of this particular species of Kangaroo is that it gives off a very powerful odor. It isn’t known why this species smells so bad! Like other species of Kangaroos the males will engage in boxing matches to determine who is dominant. From there they will have the right to mate with the females in the mob. These Kangaroos form very strong bonds that can last their entire lives. When females have other females, they will continue to be very strongly connected to each other. Even after new joeys come along they will stay very close to each other in the mob, eating together and often communicating. The Western Gray Kangaroo is more vocal than any other species. They use clicking sounds to be able to communicate with their joeys and with the other members of their mob. They have also been heard growling like dogs do in order to show defensive behavior against predators. They are sexually mature around three years of age. After successful mating it is only about 30 days before the young offspring will be born. It is able to move to the pouch on its own even though it is no bigger than a lima bean. 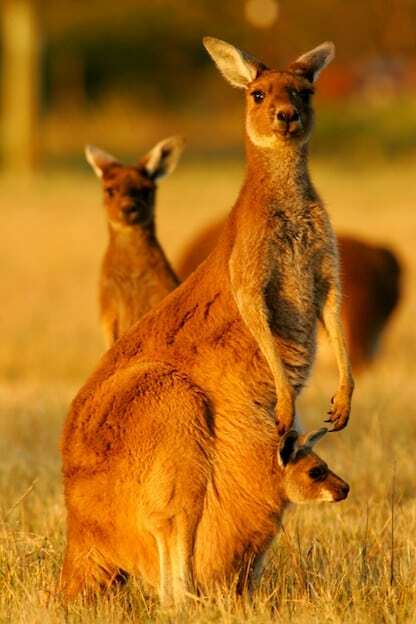 The pouch offers protection as well as the location where the young joey is able to feed from the body of the mother. Many people have been worried about the introduction of wild cats and foxes into the regions where the Western Gray Kangaroos live. These are prime predators that can cause a reduction in their numbers. Yet it is believed their population is high enough that overall it won’t knock anything out of balance. Many conservation groups are keeping a close eye on things though just in case. In fact, they high number of them in some areas have labeled them as pests. Farmers and ranchers want to keep them off their property. They can ruin the land due to eating so close to the roots of it. They also take food sources from the cattle and sheep that are being raised on open lands around there.